"The wise and virtuous man is at all times willing that his own private interest should be sacrificed to the public interest,” said Adam Smith, the 18th century philosopher renowned as the father of modern economics, and a major proponent of Laissez-faire economic policies. In essence, through Laissez-faire - - French for allow to do - - policy of minimum governmental interference in the economic affairs of individuals and society, Smith was endorsing the principle of social solidarity, today‘s concept of Public Private Partnerships (PPPs), something needed to accelerate the implementation of the National Health Insurance. Health care is one of the most important components of our quality of life. When people are sick, hurt or just not as healthy as they could be, their productivity suffers, the economy suffers, and family wellbeing suffers. As Adam Smith predicted more than 200 years ago, the PPPs are likely to become a key feature of any successful implementation of the NHI. As the 15-year implementation plan gathers momentum, the private sector needs to develop sound frameworks in which partnerships with the public sector can be enhanced. Through the PPPs, our country has the potential to increase access to critically needed services and goods that otherwise would not be available. The private sector, through either its manufacturing or delivery capability are better positioned to deliver than the public sector, so it’s not at the expense of anyone and it's a win-win situation. For example, we at AfroCentric Group and our other companies such as Medscheme, Aid for Aids, Pharmacy Direct, AfroCentric Distribution Services, and others understand that health-care reform in our country is not going to be a smooth ride. But it is exactly what the country needs to achieve universal health care coverage. The truth is while the health sector is growing, the majority of South Africans still rely on the chronically under-funded public healthcare system as their sole source of medical care. We know that only about 16 percent of South Africans have access to private health care while the rest depend on state health facilities. The NHI seeks to introduce universal health cover for every citizen to counter inequality in the distribution of health care, improve access and affordability and reduce the burden carried by the state facilities so we should not be surprised that the government is pushing on with the NHI. Health-care reform in South Africa is not going to be a smooth ride. Here are some statistics: In South Africa there are at least 43 million people who rely on the government for health care services, and just more than 7 million who belong to medical aid schemes that use private healthcare facilities. To build healthy communities and nation, we need PPPs and collaboration with the government to find solutions to social challenges. PPPs are a huge tool to be added to the toolbox to maintain and fund our health sector and health infrastructural initiatives. Delivering medication to both urban and rural areas to reduce the number of visits by patients to the healthcare through door to door delivery or delivery at a local post office or community centre. Through Curasana we provide medicine at wholesale prices to the government entities, and through Activo we produce medication generics at a lower price to ensure easier and affordable access. These partnerships deliver enhanced services with greater efficiency and effectiveness, as well as preserving best practices. In addition, by incorporating many of the positive principles of managed care on a local basis, the partnerships have the opportunity to provide improved services and thus develop strategic advantages in the market place. We are confident that PPPs can be a vital instrument for improving the health of the population. PPPs are not meant to be a substitution for lesser provisioning of government resources, nor an abdication of government responsibility, but as a tool for augmenting the public health system. We need to look at PPPs as a synergetic arrangement, which ensures, that the huge private sector also contributes to public health goals. There is no single solution to the problems of our health service. One size no longer fits all, if indeed it ever did. The complexity of modern society demands a pluralistic approach which is flexible enough to change as circumstances alter. We believe that PPPs will show the world that the idea of partnership, working together, is alive in this country, that PPPs transcend the typical economic relationship and develops bonds that are both successful and trusting. Having been in the health sector for many years, my overall objective has always been to improve services that would have a direct impact on improving patient care. We have a commitment to improve the health of our nation and to deliver reliable service to our patients and their families. We need to do this within a tight financial framework to short deadlines and timescales, and we have a duty to keep the government and the population happy. Without a shadow of doubt, this is a tall order and one that our society demands we get right. As the private sector, we have a duty to the millions of fellow South Africans to use healthy partnerships whilst ensuring accountability to the present and future generations. 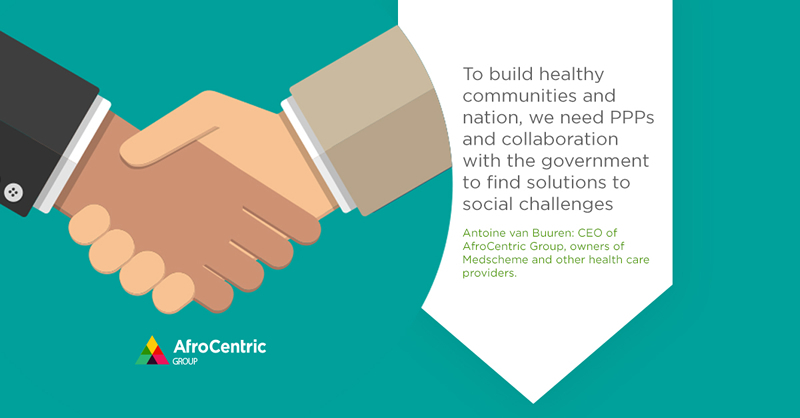 Antoine Van Buuren is CEO of AfroCentric Group, owners of Medscheme and other health care providers.